Mick and Mary visit restaurants and similar places, in Yorkshire and beyond. Today we went to Dill and Bay in Rothwell. It's a new venture started by someone who used to run a supper club. I’d read good things about it and it’s only ten minutes from where we live so we went for Sunday lunch. We were shown to a small lounge area for a drink while we looked at the menu. To start Mary went for goat’s cheese cake while I had asparagus wrapped in prosciutto with a crispy egg. Both were beautifully presented and thoroughly enjoyed. For the main course we both opted for the roast beef which came pink, though cooked through enough for my taste. 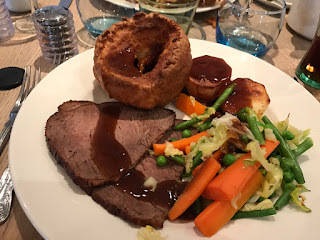 All the elements of the main course were really good - the roast potatoes had a proper crunch round the edges and the homemade Yorkshire puddings were really crisp with just the right amount of body left in the base. All the vegetables were cooked just right for us, and you could tell there was plenty of meat juice in the gravy. 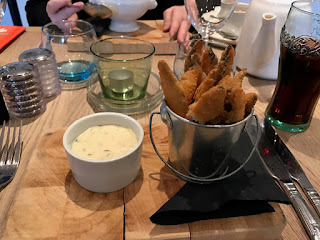 We are in the middle of the asparagus season and it showed - the soup of the day was asparagus, my starter was asparagus and there was asparagus in the bowl of vegetables with the roast beef. Unfortunately when we had finished all this we did not have enough room for dessert, which was a shame because if they were as good as the other two courses they’d have been delightful. 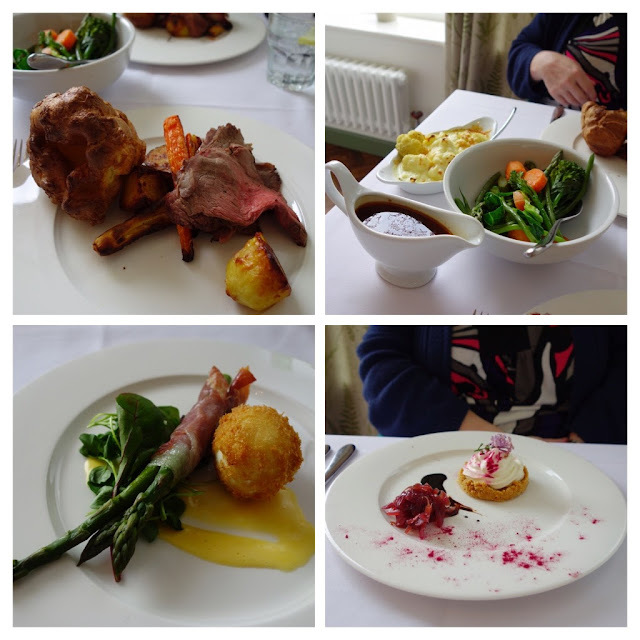 We eat out on Sunday often, and this was one of the best lunches we have had recently. We hope to visit again soon. Anyway, if Roast Beef had been on this menu I would have ordered it and so would not have ordered the Guinea Fowl dish that is shown in the biggest picture in the collage above. That would have been a shame, because it was absolutely excellent. 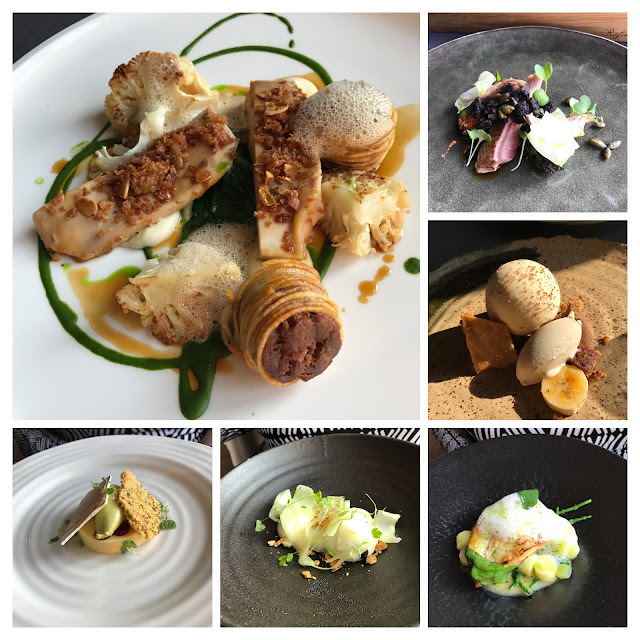 I had had the Quail dish (top right) as the starter, as well as a crispy quail's egg as an amuse bouche (not pictured) so my meal contained a lot of poultry, and I loved it all. In particular I think the Quail with black pudding and Broccoli, and also pine nuts and a little cylinder of meat made, I presume, from the quail's leg meat, was one of the best starters I have ever had. Mary had the Whipped Stilton (bottom centre) followed by the Turbot (bottom right). She thought them both excellent. They must have been as I didn't get to try them (I usually do). For dessert Mary had the Amalfi Lemon (bottom left), which again she ate all of, and liked it a lot. I had the Iced Banoffee Parfait (middle right) which was lovely. An especially nice touch was that each of the banana slices had its own individual brittle caramel top. The portents for this meal were not good when we went in, There were road works outside and there was a lot of pneumatic hammering going on. Then Mary had a little difficulty with the quite steep stairs (the restaurant is upstairs above shops and there is no disabled access). Then we found there was no Roast Beef. 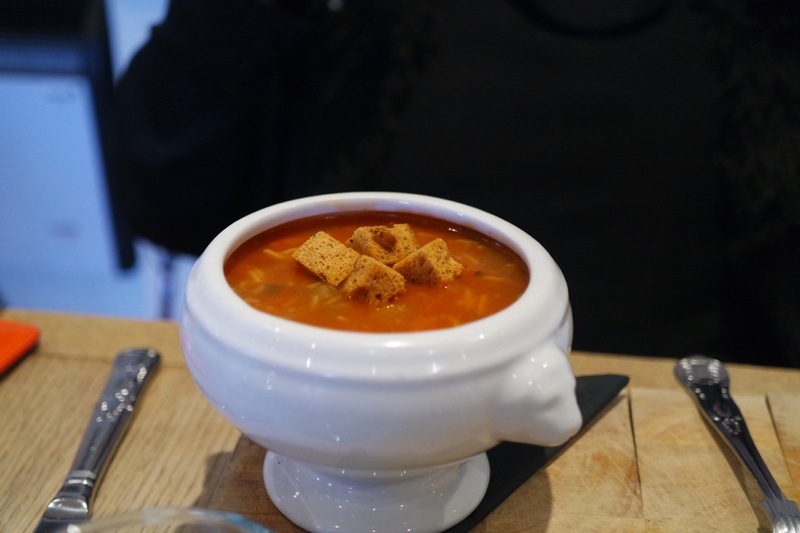 However when we left we thought it was one of the best meals we had ever had in a non-Michelin starred place, and better than some that had stars. The current 2017 edition of the Good Food Guide places L’Enclume at number one in their list of the top restaurants in the UK. 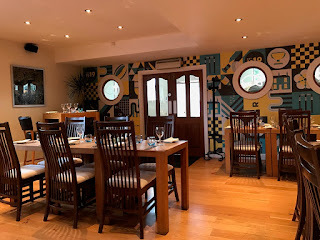 It is one of only two establishments to which it awards 10 points out of 10 for the standard of cooking (the other is Restaurant Nathan Outlaw in Cornwall). It has two Michelin stars. The Truffle pudding was the cube. It was a bit like yorkshire pudding with a blob of truffle on top. The Pork and Eel came in a very crispy shell. Both were very savoury, and strongly flavoured. A beautiful home made sour dough loaf was brought to the table after this, with two home made butters - one pasteurised, the other raw. I had been expecting some unusual things in this menu, but this was the only odd dish really. There were some very acidic pickled mushrooms, the braised leeks were very small, Tunworth was the cheese, like a white sauce. The flavours here were like nothing I had eaten together as a dish before. Among the flavourings I remember was anchovy mayonnaise. I was strongly reminded of a similar beef tartare at Raby Hunt a few months ago. It was superb. When we had nearly finished this ourse two small home made rye loaves were brought to the table. Service was by a large team of highly energetic and well co-ordinated waiters, who were all extremely happy and friendly. There was an element of theatricality to the whole service, strongly reminiscent of the Fat Duck, culminating in a performance to make and serve my coffee that had all the other diners, and me, captivated. Everything happened fast, the atmosphere was bustling but most surprisingly, it was not a hushed serenity. The noise level was quite high – I put that down to the surfaces all being hard (including the chairs, but they were comfortable enough for the two and a half hours we sat in them). I had a bottle of Loweswater Gold Cumbrian Ale, and we drank tea, coffee and tap water. The bill, including service, was £141. 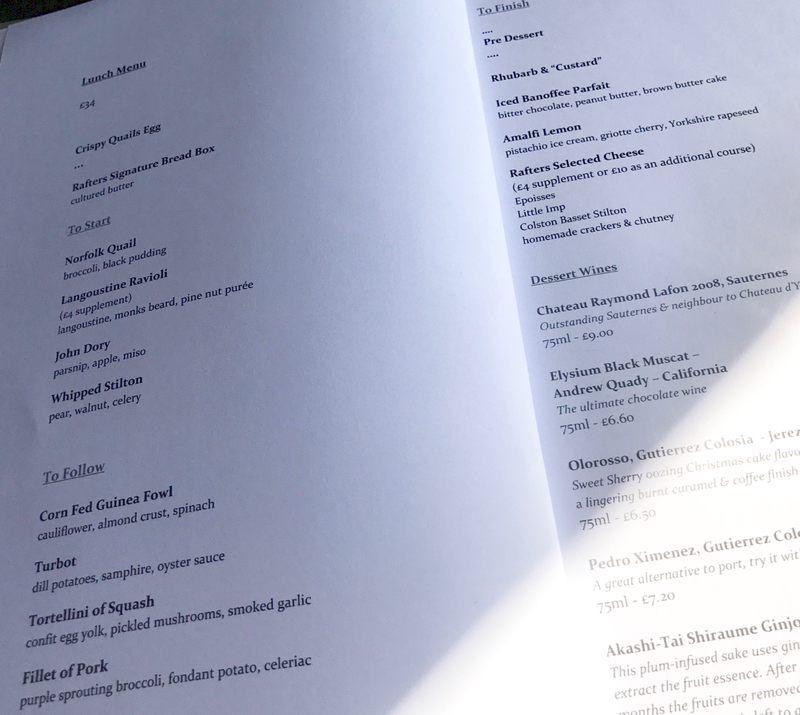 It is entirely possible that L’Enclume is the very best dining experience you can currently have in the UK. The food was consistently delicious, interesting and unusual, while the service was of the highest possible standard. You always wonder whether a restaurant can live up to all the good things written about it; L’Enclume exceeded our expectations in every way. We are on holiday this week. Today we went to Derby to see Mary's mother. 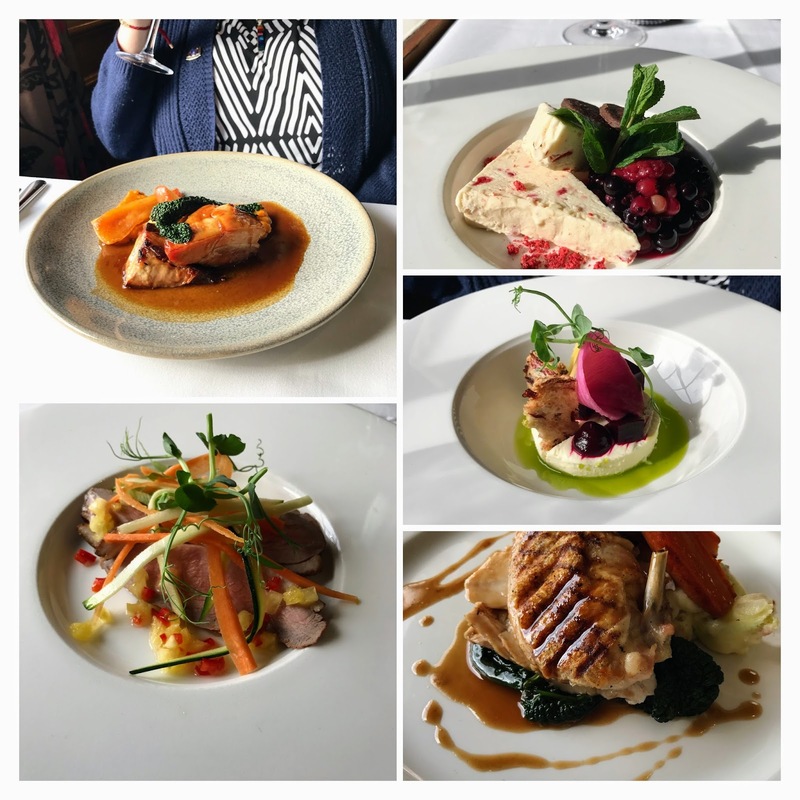 For lunch we returned to Darley's, a place we have been many times, but not so often since moving to Yorkshire. We'd forgotten just how comfortable it is - there's plenty of room between tables, and the tablecloths, serviettes and cutlery give a sense of elegance and luxury. Mary's Goat's Cheese Pannacotta with Beetroot Jelly (right middle) was probably the highlight, but the caramel sauce with the pork belly (top left) ran it very close. I had Smoked Duck Pastrami (bottom left), followed by Chicken Breast with Colcannon and Cavallo Nero (bottom right). I also had a dessert, the iced parfait with red berries (top right). It was all beautifully cooked and presented, and service was extremely efficient. Mary drank tea, I had a glass of cider. It was a lovely lunch for £52. Extremely good Sunday lunch. Wagyu beef, red cabbage and great gravy in very comfortable surroundings. The desserts didn't quite live up to the main but they were still nice. We shall return. Regular readers will recall that in the early days of this blog we used to go to Leeds Seventeen. We used to think that for value it was unbeatable. The quality was fantastic for the price; we remarked on it every time. It closed about two years ago. A placeholder website replaced its old one, leading me to think that it would re-open. It has now. It's an outstation of Brett's Fish Restaurant in Headingley. I booked online for Sunday lunch and we went today. The signage outside has all changed for the better (the old sign was hideous). The main entrance used to lead straight into a lounge/bar, through which you walked to the restaurant. That bar has been turned into the restaurant. The furniture is the same. I had seen a full menu online and thought it looked nice - fundamentally fish, but they're a fish restaurant so only to be expected. It didn't mention Sunday Lunch. The chap who seemed to be the manager told us that there was a special Sunday menu today and took our drinks order (Diet Coke and Tea). He didn't though give us a menu, and there was none on the various boards on the walls. The waitress came to take our order. She told us the menu. 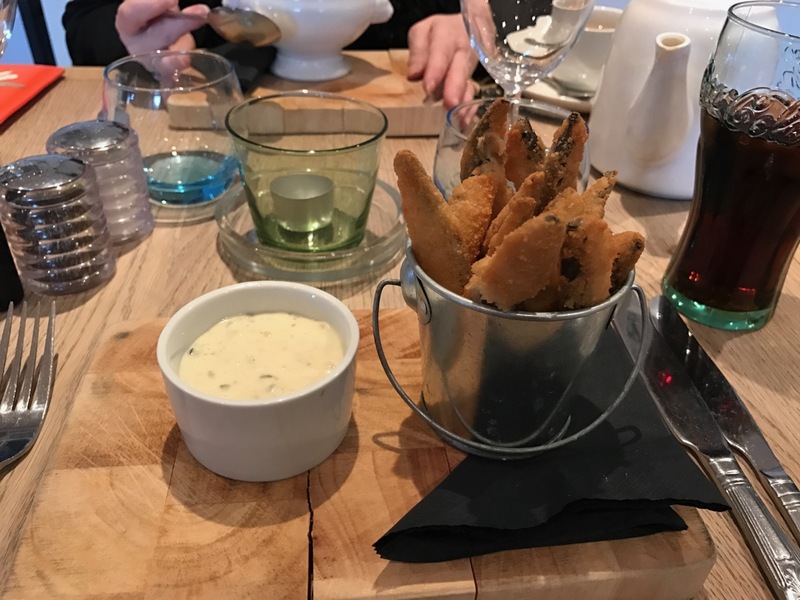 Starters were Whitebait (one of my very favourite restaurant dishes) or Minestrone. We chose one of each. 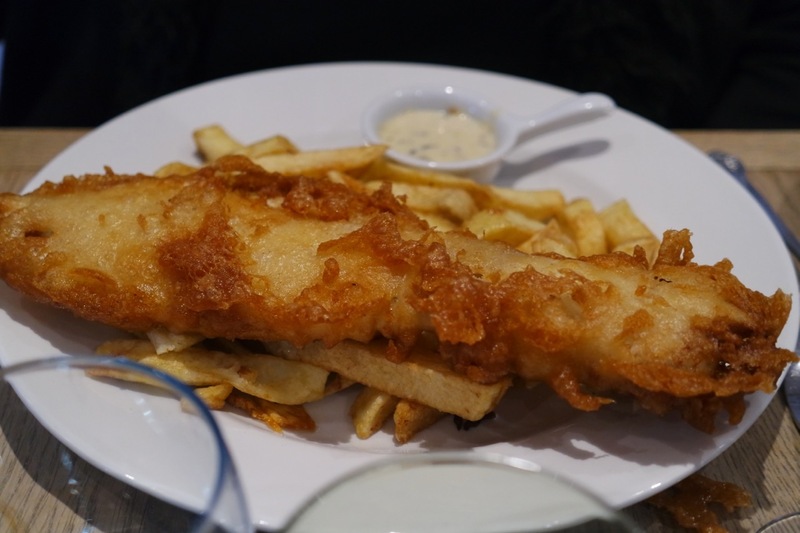 Main courses were Sunday Roast (Beef or Pork), or Fish and Chips. Again we chose one of each. We were now ready to pay the bill. You will remember that we had not seen a menu, nor been told the price of anything. So we tried to guess. We both got it wrong. The two course lunch only cost £10 each, plus drinks. It's great to see that the tradition for good value is being continued. Lovely Roast Beef Sunday Lunch. Their speciality is Argentinian beef and it was exceptional. It was rump cooked medium rare with a wide strip of fat attached and was among the very best we have had recently, including some Dexter and Wagyu. The "Josper" roasted carrot was also very good, as was the red wine gravy. Yorkshire pudding was good too, and roast potatoes were ok (not crispy enough). Mary was not impressed that onion rings had found their way onto the plate, though I rather enjoyed them. The drink you can see was a "CAU Cooler" of Raspberry, Apple, Passion Fruit and Grape, and was delicious. The atmosphere for a Sunday lunch was very "buzzy" - more like an evening. It feels a bit more like a night club than most places we go. In addition there were lots of young people photographing their food. I look forward to going again to try a steak. The contents of this blog represent the opinions of the authors alone. No inducements of any kind have been sought or offered to write any of the content. All meals described have been bought and paid for by the authors.